We investigate the functions and crosstalk of proteins and phospholipids that give rise to the complex architecture, functional asymmetry and dynamics of the mitochondrial inner membrane. In contrast to the smooth mitochondrial outer membrane, the inner membrane (IM) has an intricate, characteristic morphology that optimally supports oxidative phosphorylation. The IM comprises two subdomains that are topologically and functionally distinct: The flat inner boundary membrane hosts the protein import machinery, while the cristae, tubular or sheet-like membrane folds, harbour the complexes of the respiratory chain. These two subdomains are connected by a narrow, tubular structure with high local membrane curvature, the crista junction, that constitutes a diffusion barrier between the specialized membrane compartments. A conserved IM protein complex, the mitochondrial contact site and cristae organizing system (MICOS), is required to maintain crista junctions and directly induces negative membrane curvature at the crista junction. 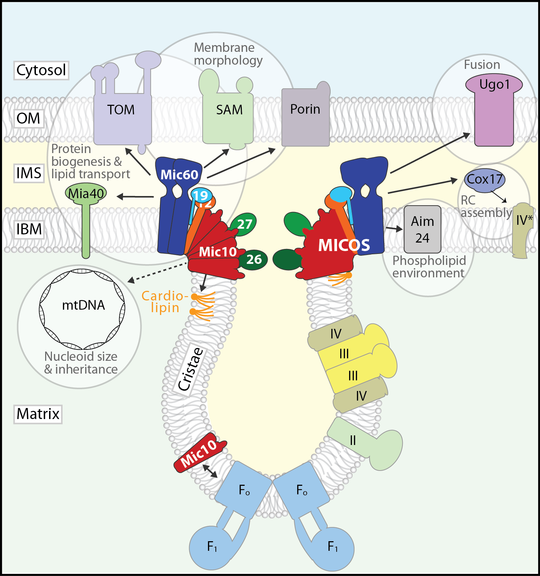 In recent years, MICOS has emerged as a central hub in an interaction network spanning as diverse functions as protein biogenesis, respiratory chain assembly, phospholipid remodelling and transport, mitochondrial dynamics, and nucleoid inheritance. The interaction network of the mitochondrial contact site and cristae organizing system (MICOS). Modified after Rampelt et al., 2017, Biochim. Biophys. Acta 1864: 737-746. Aside from MICOS, several other proteins as well as the non-bilayer forming phospholipids cardiolipin and phosphatidylethanolamine influence the morphology and dynamics of the IM. We study the crosstalk between MICOS and both protein and phospholipid determinants of cristae morphology, for example the communication between MICOS and the F1Fo-ATP synthase: With respect to cristae biogenesis, the F1Fo-ATP synthase performs a role complementing that of MICOS: It imposes positive membrane curvature by forming angular dimer rows that localize to the cristae rims and tips. Consequently, both MICOS and F1Fo-ATP synthase are required to establish native cristae architecture. We have discovered that the MICOS core component Mic10 interacts with dimeric F1Fo-ATP synthase, suggesting that the two complexes might coordinate their activities. This finding is particularly exciting since the mechanisms of cristae biogenesis are practically unknown.